SPACE permitting, a garden is incomplete unless it has a few fruit plants besides a patch of vegetables and ornamental plants. Besides having immense nutritive value, most fruit plants possess tremendous ornamental appeal too. When bearing blooms and fruits they present a spectacular sight. The area comprising the submontaneous zone, Gurdaspur, Hoshiarpur, Ropar, Chandigarh, parts of Patiala, Panchkula and Ambala districts is the most blessed as the climate here allows successful growing of a large number of fruit species. Mango, litchi, chikoo, various citrus fruits like kinnow, sweet orange, grapefruit, lemon, mitha, deciduous fruits like peach, plum, pear, grapes, mulberry, phalsa, anar, amla, ber, guava, loquat, papaya, jamun and custard apple are some of these. Depending upon the family choice, one can go in for the kind of fruit one likes the most. 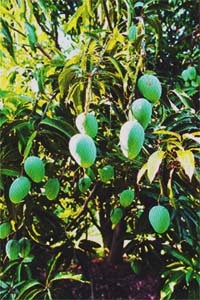 Mango, the king of fruits, finds its natural home here and is most successfully grown provided a little care is given at the right time. The dusehri, langra and chausa varieties are recommended for this region. These are also some of the grafted varieties of mangoes, GN 1 to GN 7, that start bearing fruit within three to four years of planting, defying the age old saying: Dada beejey te potta khaye (sown by the grandfather, reaped by the grandson). When it comes to bearing fruit in bunches, nothing can beat litchi. The tree itself has tremendous ornamental value. It has a round crown with shining foliage, a tree that qualifies to be planted even in the frontyard. The 'Dehradun' variety is an early, regular and a heavy bearer of fruit. 'Calcuttia' also bears a lot of fruit which is of excellent quality. The other plus point is that it is less prone to splitting. Another kind that can be planted is the 'seedless late' variety with a very small and shriveled seed. But it is also prone to splitting and is also bears fruit irregularly. The Allahabad safeda variety of guava has a compact and dwarf tree that bears round and smooth delicious fruits. Sardar guava or L-49 is another variety that too is a dwarf in height but bears rough skinned fruit with ribs on the shoulder. In case of chikoo and loquat, however, you may not get any named variety but plants obtained from a reliable source are sure to give good quality fruit. Lemon is a must have plant in the garden. You can have it from a source which has a good and tested mother plant. You can also prepare a plant yourself by gooti (air layering) if a good plant is available with one of your friends. Likewise, you can take a phalsa cutting and plant it to get a sapling that will be ready by next year. In case of a good quality papaya, you can take fresh seeds and sow them. You may expect good quality fruit from the plants thus raised. You can also get Pusa Delicious and Pusa Dwarf varieties from the Department of Horticulture, Punjab Agricultural University, from where you can get other fruit saplings too, except chikoo.